Boo Day 601 Splash was laying in the Queen’s bed. Boo got pets on the bed. The cats had some play time on a shamrock blanket. 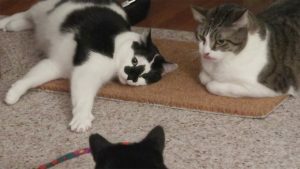 The cats did a live stream. Simba slept in a weird position. Hydrox was meowing at me through the windows.